I have recently come across a couple of websites particularly relevant to PAT testing that are well worth mentioning here. The first is the Digital Museum of Plugs and Sockets. 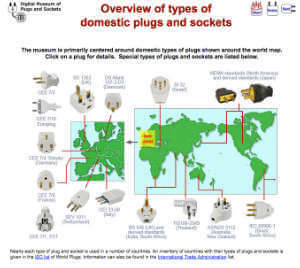 The online museum has been created by Oof Oud from the Netherlands, a private collector of ‘old and new plugs, sockets and related devices from all over the world’. The second site I found by following a link on Oof’s site and it led me to Museum of Old Electrical Items, created by Jon Ward at Flameport Enterprises Ltd. Jon has meticulously documented many old UK plugs, sockets and other electrical equipment. The information on the rest of his site is also well worth looking at. Both sites have lots of useful information relevant to anyone carrying out PAT testing.